This section describes sensor axes, base sensors, and composite sensors (activity, attitude, uncalibrated, and interaction). Sensor event values from many sensors are expressed in a specific frame that is static relative to the device. The Sensor API is relative only to the natural orientation of the screen (axes are not swapped when the device's screen orientation changes. Figure 1. Coordinate system (relative to a mobile device) used by the Sensor API. Figure 2. 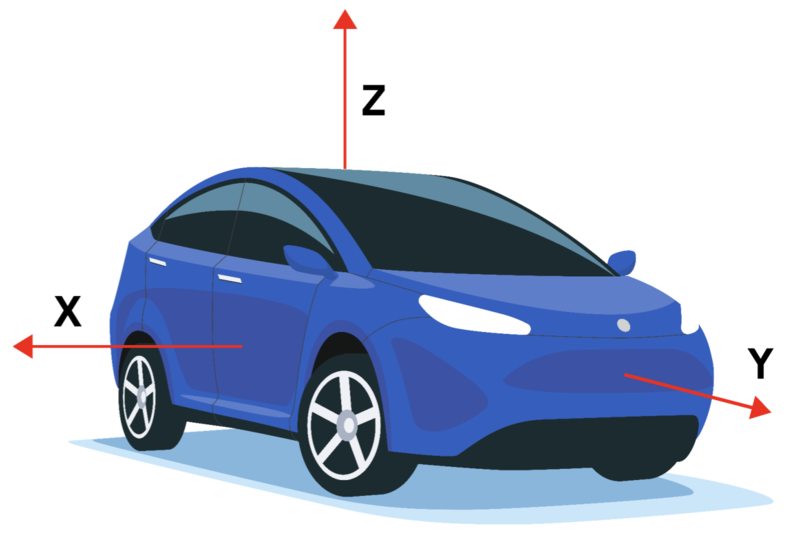 Coordinate system (relative to an automotive device) used by the Sensor API. The origin of the coordinate system is located at the center of the vehicle’s rear axle. When looking from the positive direction of an axis, positive rotations are counterclockwise. Thus, when a vehicle is making a left turn, the z-axis gyroscope rate of turn is expected to be a positive value. Note: For details on each Android sensor type, review the following sections. However, base sensors are not equal to and should not be confused with their underlying physical sensor. The data from a base sensor is not the raw output of the physical sensor because corrections (such as bias compensation and temperature compensation) are applied. A gyroscope chip rated to have a bias range of 1 deg/sec. After factory calibration, temperature compensation and bias compensation are applied, the actual bias of the Android sensor will be reduced, may be to a point where the bias is guaranteed to be below 0.01deg/sec. In this situation, we say that the Android sensor has a bias below 0.01 deg/sec, even though the data sheet of the underlying sensor said 1 deg/sec. A barometer with a power consumption of 100uW. Because the generated data needs to be transported from the chip to the SoC, the actual power cost to gather data from the barometer Android sensor might be much higher, for example 1000uW. In this situation, we say that the Android sensor has a power consumption of 1000uW, even though the power consumption measured at the barometer chip leads is 100uW. A magnetometer that consumes 100uW when calibrated, but consumes more when calibrating. Its calibration routine might require activating the gyroscope, consuming 5000uW, and running some algorithm, costing another 900uW. In this situation, we say that the maximum power consumption of the (magnetometer) Android sensor is 6000uW. In this case, the average power consumption is the more useful measure, and it is what is reported in the sensor static characteristics through the HAL. An accelerometer sensor reports the acceleration of the device along the 3 sensor axes. The measured acceleration includes both the physical acceleration (change of velocity) and the gravity. The measurement is reported in the x, y and z fields of sensors_event_t.acceleration. All values are in SI units (m/s^2) and measure the acceleration of the device minus the force of gravity along the 3 sensor axes. The norm of (x, y, z) should be close to 0 when in free fall. When the device lies flat on a table, the acceleration value along z is +9.81 alo, which corresponds to the acceleration of the device (0 m/s^2) minus the force of gravity (-9.81 m/s^2). When the device lies flat on a table and is pushed toward the sky, the acceleration value is greater than +9.81, which corresponds to the acceleration of the device (+A m/s^2) minus the force of gravity (-9.81 m/s^2). The bias and scale calibration must only be updated while the sensor is deactivated, so as to avoid causing jumps in values during streaming. The accelerometer also reports how accurate it expects its readings to be through sensors_event_t.acceleration.status. See the SensorManager’s SENSOR_STATUS_* constants for more information on possible values for this field. This sensor provides the ambient (room) temperature in degrees Celsius. A magnetic field sensor (also known as magnetometer) reports the ambient magnetic field, as measured along the 3 sensor axes. The measurement is reported in the x, y and z fields of sensors_event_t.magnetic and all values are in micro-Tesla (uT). The magnetometer also reports how accurate it expects its readings to be through sensors_event_t.magnetic.status. See the SensorManager’s SENSOR_STATUS_* constants for more information on possible values for this field. Rotation is positive in the counterclockwise direction (right-hand rule). That is, an observer looking from some positive location on the x, y or z axis at a device positioned on the origin would report positive rotation if the device appeared to be rotating counter clockwise. Note that this is the standard mathematical definition of positive rotation and does not agree with the aerospace definition of roll. The measurement is reported in the x, y and z fields of sensors_event_t.gyro and all values are in radians per second (rad/s). The gyroscope also reports how accurate it expects its readings to be through sensors_event_t.gyro.status. See the SensorManager’s SENSOR_STATUS_* constants for more information on possible values for this field. The gyroscope cannot be emulated based on magnetometers and accelerometers, as this would cause it to have reduced local consistency and responsiveness. It must be based on a usual gyroscope chip. A heart rate sensor reports the current heart rate of the person touching the device. The current heart rate in beats per minute (BPM) is reported in sensors_event_t.heart_rate.bpm and the status of the sensor is reported in sensors_event_t.heart_rate.status. See the SensorManager’s SENSOR_STATUS_* constants for more information on possible values for this field. In particular, upon the first activation, unless the device is known to not be on the body, the status field of the first event must be set to SENSOR_STATUS_UNRELIABLE. Because this sensor is on-change, events are generated when and only when heart_rate.bpm or heart_rate.status have changed since the last event. The events are generated no faster than every sampling_period. The measurement is reported in sensors_event_t.light. Up to Android KitKat, the proximity sensors were always wake-up sensors, waking up the SoC when detecting a change in proximity. After Android KitKat, we advise to implement the wake-up version of this sensor first, as it is the one that is used to turn the screen on and off while making phone calls. The measurement is reported in centimeters in sensors_event_t.distance. Note that some proximity sensors only support a binary "near" or "far" measurement. In this case, the sensor report its sensor_t.maxRange value in the "far" state and a value less than sensor_t.maxRange in the "near" state. A pressure sensor (also known as barometer) reports the atmospheric pressure in hectopascal (hPa). The barometer is often used to estimate elevation changes. To estimate absolute elevation, the sea-level pressure (changing depending on the weather) must be used as a reference. A relative humidity sensor measures relative ambient air humidity and returns a value in percent. Step detector and Significant motion, which are usually based on an accelerometer, but could be based on other sensors as well, if the power consumption and accuracy was acceptable. Game rotation vector, based on an accelerometer and a gyroscope. Uncalibrated gyroscope, which is similar to the gyroscope base sensor, but with the bias calibration being reported separately instead of being corrected in the measurement. As with base sensors, the characteristics of the composite sensors come from the characteristics of their final data. For example, the power consumption of a game rotation vector is probably equal to the sum of the power consumptions of the accelerometer chip, the gyroscope chip, the chip processing the data, and the buses transporting the data. As another example, the drift of a game rotation vector depends as much on the quality of the calibration algorithm as on the physical sensor characteristics. The following table lists available composite sensor types. Each composite sensor relies on data from one or several physical sensors. Avoid choosing other underlying physical sensors to approximate results as they provide a poor user experience. Note: When there is no gyroscope on the device (and only when there is no gyroscope), you may implement the rotation vector, linear acceleration, and gravity sensors without using the gyroscope. A linear acceleration sensor reports the linear acceleration of the device in the sensor frame, not including gravity. The output is conceptually: output of the accelerometer minus the output of the gravity sensor. It is reported in m/s^2 in the x, y and z fields of sensors_event_t.acceleration. Readings on all axes should be close to 0 when the device is immobile. If the device possesses a gyroscope, the linear acceleration sensor must use the gyroscope and accelerometer as input. If the device doesn’t possess a gyroscope, the linear acceleration sensor must use the accelerometer and the magnetometer as input. Implement only the wake-up version of this sensor. A significant motion detector triggers when the detecting a “significant motion”: a motion that might lead to a change in the user location. At the high level, the significant motion detector is used to reduce the power consumption of location determination. When the localization algorithms detect that the device is static, they can switch to a low power mode, where they rely on significant motion to wake the device up when the user is changing location. The goal of this sensor is to save power. Triggering an event when the user is not moving (false positive) is costly in terms of power, so it should be avoided. Not triggering an event when the user is moving (false negative) is acceptable as long as it is not done repeatedly. If the user has been walking for 10 seconds, not triggering an event within those 10 seconds is not acceptable. A step detector generates an event each time a step is taken by the user. The timestamp of the event sensors_event_t.timestamp corresponds to when the foot hit the ground, generating a high variation in acceleration. Compared to the step counter, the step detector should have a lower latency (less than 2 seconds). Both the step detector and the step counter detect when the user is walking, running and walking up the stairs. They should not trigger when the user is biking, driving or in other vehicles. This sensor must be low power. That is, if the step detection cannot be done in hardware, this sensor should not be defined. In particular, when the step detector is activated and the accelerometer is not, only steps should trigger interrupts (not every accelerometer reading). sampling_period_ns has no impact on step detectors. A step counter reports the number of steps taken by the user since the last reboot while activated. The measurement is reported as a uint64_t in sensors_event_t.step_counter and is reset to zero only on a system reboot. The timestamp of the event is set to the time when the last step for that event was taken. See the Step detector sensor type for the signification of the time of a step. Compared to the step detector, the step counter can have a higher latency (up to 10 seconds). Thanks to this latency, this sensor has a high accuracy; the step count after a full day of measures should be within 10% of the actual step count. Both the step detector and the step counter detect when the user is walking, running and walking up the stairs. They should not trigger when the user is biking, driving or in other vehicles. The hardware must ensure the internal step count never overflows. The minimum size of the hardware's internal counter shall be 16 bits. In case of imminent overflow (at most every ~2^16 steps), the SoC can be woken up so the driver can do the counter maintenance. As stated in Interaction, while this sensor operates, it shall not disrupt any other sensors, in particular, the accelerometer, which might very well be in use. If a particular device cannot support these modes of operation, then this sensor type must not be reported by the HAL. ie: it is not acceptable to "emulate" this sensor in the HAL. This sensor must be low power. That is, if the step detection cannot be done in hardware, this sensor should not be defined. In particular, when the step counter is activated and the accelerometer is not, only steps should trigger interrupts (not accelerometer data). A tilt detector generates an event each time a tilt event is detected. reference_estimated_gravity = average of accelerometer measurements over the first second after activation or the estimated gravity when the last tilt event was generated. current_estimated_gravity = average of accelerometer measurements over the last 2 seconds. Large accelerations without a change in phone orientation should not trigger a tilt event. For example, a sharp turn or strong acceleration while driving a car should not trigger a tilt event, even though the angle of the average acceleration might vary by more than 35 degrees. Typically, this sensor is implemented with the help of only an accelerometer. Other sensors can be used as well if they do not increase the power consumption significantly. This is a low power sensor that should allow the SoC to go into suspend mode. Do not emulate this sensor in the HAL. Each sensor event reports 1 in sensors_event_t.data. X points east and is tangential to the ground. Y points north and is tangential to the ground. The orientation of the phone is represented by the rotation necessary to align the East-North-Up coordinates with the phone's coordinates. That is, applying the rotation to the world frame (X,Y,Z) would align them with the phone coordinates (x,y,z). The quaternion is a unit quaternion: it must be of norm 1. Failure to ensure this will cause erratic client behaviour. The heading error must be less than estimated_accuracy 95% of the time. This sensor must use a gyroscope as the main orientation change input. This sensor also uses accelerometer and magnetometer input to make up for gyroscope drift, and it cannot be implemented using only the accelerometer and magnetometer. A game rotation vector sensor is similar to a rotation vector sensor but not using the geomagnetic field. Therefore the Y axis doesn't point north but instead to some other reference. That reference is allowed to drift by the same order of magnitude as the gyroscope drifts around the Z axis. See the Rotation vector sensor for details on how to set sensors_event_t.data[0-3]. This sensor does not report an estimated heading accuracy: sensors_event_t.data is reserved and should be set to 0. In an ideal case, a phone rotated and returned to the same real-world orientation should report the same game rotation vector. This sensor must be based on a gyroscope and an accelerometer. It cannot use magnetometer as an input, besides, indirectly, through estimation of the gyroscope bias. A gravity sensor reports the direction and magnitude of gravity in the device's coordinates. The gravity vector components are reported in m/s^2 in the x, y and z fields of sensors_event_t.acceleration. When the device is at rest, the output of the gravity sensor should be identical to that of the accelerometer. On Earth, the magnitude is around 9.8 m/s^2. If the device possesses a gyroscope, the gravity sensor must use the gyroscope and accelerometer as input. If the device doesn’t possess a gyroscope, the gravity sensor must use the accelerometer and the magnetometer as input. 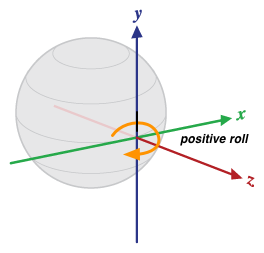 A geomagnetic rotation vector is similar to a rotation vector sensor but using a magnetometer and no gyroscope. This sensor must be based on a magnetometer. It cannot be implemented using a gyroscope, and gyroscope input cannot be used by this sensor. See the Rotation vector sensor for details on how to set sensors_event_t.data[0-4]. Just like for the rotation vector sensor, the heading error must be less than the estimated accuracy (sensors_event_t.data) 95% of the time. This sensor must be low power, so it has to be implemented in hardware. Note: This is an older sensor type that has been deprecated in the Android SDK. It has been replaced by the rotation vector sensor, which is more clearly defined. Use the rotation vector sensor over the orientation sensor whenever possible. sensors_event_t.orientation.y: pitch, rotation around X axis (-180<=pitch<=180), with positive values when the z-axis moves toward the y-axis. sensors_event_t.orientation.z: roll, rotation around Y axis (-90<=roll<=90), with positive values when the x-axis moves towards the z-axis. Figure 3. 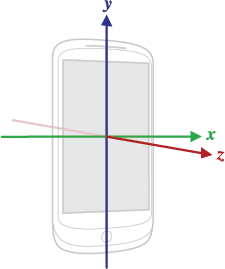 Orientation relative to a device. This definition is different from yaw, pitch and roll used in aviation where the X axis is along the long side of the plane (tail to nose). The orientation sensor also reports how accurate it expects its readings to be through sensors_event_t.orientation.status. See the SensorManager’s SENSOR_STATUS_* constants for more information on possible values for this field. Uncalibrated sensors provide more raw results and may include some bias but also contain fewer "jumps" from corrections applied through calibration. Some applications may prefer these uncalibrated results as smoother and more reliable. For instance, if an application is attempting to conduct its own sensor fusion, introducing calibrations can actually distort results. Conceptually, the uncalibrated measurement is the sum of the calibrated measurement and the bias estimate: _uncalibrated = _calibrated + _bias. The x/y/z_bias values are expected to jump as soon as the estimate of the bias changes, and they should be stable the rest of the time. See the definition of the gyroscope sensor for details on the coordinate system used. Factory calibration and temperature compensation must be applied to the measurements. Also, gyroscope drift estimation must be implemented so that reasonable estimates can be reported in x_bias, y_bias and z_bias. If the implementation is not able to estimate the drift, then this sensor must not be implemented. If this sensor is present, then the corresponding Gyroscope sensor must also be present and both sensors must share the same sensor_t.name and sensor_t.vendor values. The uncalibrated magnetometer allows higher level algorithms to handle bad hard iron estimation. The x/y/z_bias values are expected to jump as soon as the estimate of the hard-iron changes, and they should be stable the rest of the time. Soft-iron calibration and temperature compensation must be applied to the measurements. Also, hard-iron estimation must be implemented so that reasonable estimates can be reported in x_bias, y_bias and z_bias. If the implementation is not able to estimate the bias, then this sensor must not be implemented. If this sensor is present, then the corresponding magnetic field sensor must be present and both sensors must share the same sensor_t.name and sensor_t.vendor values. A wake up gesture sensor enables waking up the device based on a device specific motion. When this sensor triggers, the device behaves as if the power button was pressed, turning the screen on. This behavior (turning on the screen when this sensor triggers) might be deactivated by the user in the device settings. Changes in settings do not impact the behavior of the sensor: only whether the framework turns the screen on when it triggers. The actual gesture to be detected is not specified, and can be chosen by the manufacturer of the device. This sensor must be low power, as it is likely to be activated 24/7. Each sensor event reports 1 in sensors_event_t.data. A pick-up gesture sensor triggers when the device is picked up regardless of wherever it was before (desk, pocket, bag). A glance gesture sensor enables briefly turning the screen on to enable the user to glance content on screen based on a specific motion. When this sensor triggers, the device will turn the screen on momentarily to allow the user to glance notifications or other content while the device remains locked in a non-interactive state (dozing), then the screen will turn off again. This behavior (briefly turning on the screen when this sensor triggers) might be deactivated by the user in the device settings. Changes in settings do not impact the behavior of the sensor: only whether the framework briefly turns the screen on when it triggers. The actual gesture to be detected is not specified, and can be chosen by the manufacturer of the device. This sensor must be low power, as it is likely to be activated 24/7. Each sensor event reports 1 in sensors_event_t.data.